A dental crown is a cap placed over a tooth to protect it from wear and tear. Crowns resemble a real tooth and help in restoring the shape, size, structure, and strength of a tooth that has suffered severe decay or has undergone a root canal treatment. A crown is not a tooth substitute, and rather it is placed just above the tooth to cover the exposed portion above or at the gum line. To save a tooth severely damaged due to decay that cannot support a filling. To administer a one-time solution and doing away with the need of multiple treatments requiring general anesthesia, as children might not be able to handle it due to their age, medical history and might be unable to cooperate through the procedures. To protect the tooth of a child with poor dental hygiene from risk of decay and other dental issues. There are various types of dental crowns made of different materials. You can take your pick depending on the strength, longevity, and affordability you are comfortable with. There are mainly six types of dental crowns that are usually recommended by dentists. Metal crowns: These crowns are made of alloys with a high concentration of platinum or gold, or other base metal alloys, such as nickel chromium or cobalt chromium. One of the biggest reasons why metal crowns are widely used is because of the pressure they can withstand during biting and chewing, given the inherent strength these metals have. These crowns are least susceptible to cracking or chipping and last much longer than other crowns. Their metallic color is their only drawback which makes them a bit unsightly for teeth that are visible. That’s why metal crowns are usually opted for the molars that are out-of-sight and also subjected to maximum chewing pressures. Porcelain-fused metal crowns: These crowns combine the best of both worlds by providing quality, strength, and look, all in one solution. The outer porcelain cover can be matched to the color of your tooth thereby giving the crown a natural look instead of a metal look. Also, since the base material happens to be metal, it adds to the strength and longevity of the crown and the tooth. The outer porcelain, however, is susceptible to chipping or breaking and might also reveal a dark line near the gum line, in the event that the gums start receding. All-porcelain: This is yet another option that gives you the chance to choose a crown that matches your teeth’s color perfectly. All-ceramic is also a choice that dentists are offering patients, these days. These options are best for people who suffer from metal allergies. Also, all ceramic or all-porcelain crowns can be used for teeth, both in the front and at the back. All-resin: These dental crowns are comparatively cheaper than their all-porcelain and all-ceramic counterparts; however, they are susceptible to breakage and chipping. Temporary: These crowns are fabricated quickly in the dentist’s office using acrylic-based materials or stainless-steel. These, however, are only used to protect the tooth from breakage till the permanent crown is sent over from the lab where it is constructed. At Somi Dental Group we make and install the temporary crowns, as soon as they are done with the dental work, which takes only a few minutes. WHAT ARE THE STEPS REQUIRED TO INSTALL DENTAL CROWNS? 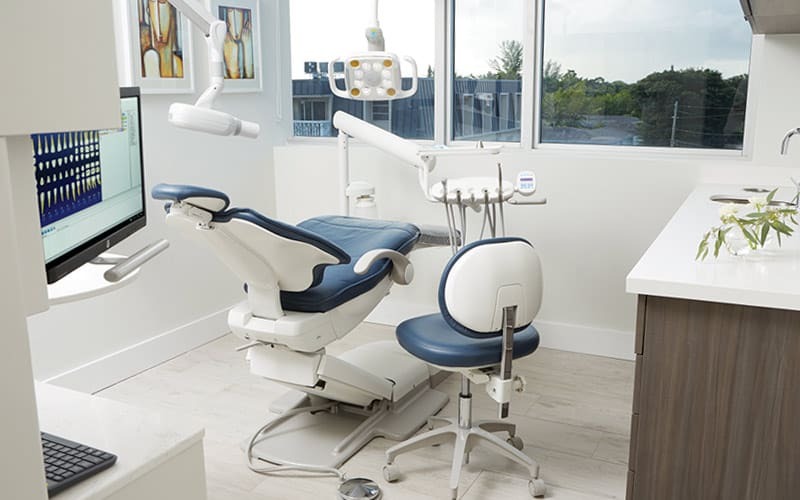 Your Miami dental crowns expert may recommend you have a dental crown installed if your tooth has undergone extensive decay and is in need of a filling or a root canal treatment. This is mainly done to ensure that the decay does not lead to infection or injury to the pulp of the tooth. The treated tooth will need some kind of protection or covering to help restore its strength. Before applying the crown, the dentist will need to prepare the tooth so that it can hold the crown, properly. To do this, the dentist will anesthetize the gum tissues around the tooth and file down the tooth to smoothen the chewing surface so that the crown can be easily cemented to it. If your tooth has suffered considerable decay and has lost a substantial portion of its structure, then the dentist will apply some filling material to help build up the missing tooth so that it can support the crown. Once the tooth has been reshaped, the dentist will then use a digital scanner or use some putty to take the impression of the reshaped tooth which will then be sent to the laboratory for constructing the actual crown. The impression helps ensure that your bite is not affected by the new crown. While you wait for the lab to send over the crown, which usually takes around two to three weeks, the dentist will install a temporary crown to keep your tooth protected. Upon receiving the crown from the lab, Dr. Lopez or Dr. Vasquez will again anesthetize your gum line and tooth, remove the temporary crown and cement the new crown permanently in its place. You can ensure your crown’s longevity by maintaining oral hygiene by brushing your teeth twice, every day, and flossing and rinsing your mouth with a mouthwash on a daily basis. If you have any questions or would like to learn more about dental crowns please fill out the form provided or give us a call and one of our office staff will contact you shortly.